Can LG play in the big league? The iPhone 6S is a true flagship. With an unusual design, powerful camera and super-sharp display the LG G4 was really built to stand out, and while in some ways it did so for the wrong reasons it's still one of the more impressive and unique phones of 2015. The iPhone 6S is sure to outsell it and with a premium build, powerful processor and great camera it's clearly a top phone too, but does it have the LG G4 beat? The iPhone 6S is unmistakeably an Apple product, with a slim metal build and distinctive Touch ID fingerprint scanner. It's one of Apple's best looking phones too, though it's almost identical to the iPhone 6. The LG G4 is even more unmistakeable, but not necessarily in a good way. The leather back is an interesting choice, but it's stretched too thin to feel good, while the plastic version is, well, plastic. Then there's its rear keys, which are easier to defend as some people swear by them, but they're certainly divisive. They're supposedly in a more natural position to hit, but they can take some getting used to if you're coming from any non-LG phone. The iPhone 6S has a 4.7-inch 1334 x 750 display, so it's both fairly compact and pretty sharp. At 5.5 inches the LG G4 is far from compact yet at 1440 x 2560 it's still far sharper than the iPhone 6S. In fact it has an impressively high pixel density of 538 pixels per inch. It's deep and rich too, despite being IPS LCD. Does the LG G4 have a better screen than the iPhone 6S? It's too soon to say, but it's certainly one of the best QHD displays we've yet seen. The LG G4 isn't quite the most powerful phone around, but with a hexa-core Snapdragon 808 processor and 3GB of RAM it's not far off. You could say the same about the iPhone 6S though with its beefy Apple A9 processor. The LG G4 delivers generally slick performance and the iPhone 6S should as well, especially as with Apple creating both the hardware and software there's greater unity between them. One thing the LG G4 really gets right is its camera, as with a 16MP sensor, an f/1.8 aperture for great low light shots, optical image stabilisation and a speedy laser autofocus there's a lot of fancy tech here. It comes together well and it's coupled with deep manual controls, so you can tweak the settings to your heart's content. With an 8MP camera on the front the LG G4 is also adept at selfies if you're into that kind of thing. The iPhone 6S should have a top of the range smartphone snapper as well though, as its 12MP rear sensor and 5MP front-facing ones are both upgrades over the already great iPhone 6 camera. You can't fine tune shots to quite the same extent as with the LG G4, but if you mostly want to point and shoot the iPhone 6S could be a real winner. The LG G4 runs Android 5.1 overlaid with its Optimus user interface and for the most part it's pretty good. It's refined, clean and colourful and while it's distinct from stock Android it uses a lot of the Material Design language, so it's not totally alien. 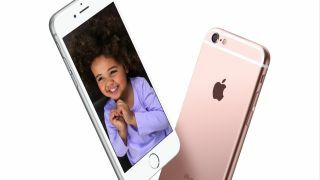 The iPhone 6S meanwhile runs iOS 9, which is the brand new version of Apple's mobile operating system. It's not a radical change from iOS 8 but there are a number of improvements. Siri has become a little more helpful, while new features such as public transport directions have been added to Apple Maps among other things. It's worth giving a shout-out to 3D Touch here too. Apple's pressure sensitive technology changes the way you interact with the iPhone 6S, presenting you with different options depending on how hard you press the screen and it could make using the phone faster and more intuitive than ever. LG flagships often have good battery life, but sadly the LG G4 doesn't. It's not awful, but it is in the camp that just barely lasts a day of moderate use, though it's at least removable so you can always swap it out for a spare. The iPhone 6S does not have a removable battery, but if Apple is to be believed it should hopefully last for up to 14 hours of talk time or 11 hours of video, which sounds reasonable. Time will tell how true that is. While LG's flagships usually undercut the competition the LG G4 had a fairly premium price, but it quite quickly dropped and can now be picked up from around £330 ($470, AU$800) SIM free, while the iPhone 6S starts at £539 ($649, AU$1,079), so LG's phone is a lot cheaper. It's also likely to be easier to get hold of, as demand for the iPhone 6S will be enormously high, so expect stock to shoot off the shelves. With a fantastic camera, a brilliant screen and strong performance the LG G4 is undoubtedly a flagship, but it falters in several significant ways, from its unappealing design to its mediocre battery life. The iPhone 6S is likely the better phone overall then, but it's also more expensive and the LG G4 will have its fans, especially with unusual features like its rear keys.